"You can make these easy salmon foil packets ahead of time or as a last minute dinner idea. Feel free to switch up the seasoning or vegetables to your liking. Perfect for the oven or the outdoor grill." Set out 2 large squares of foil, nonstick side up, one on top of the other. Layer sweet potato, zucchini, and squash in the middle of the top sheet, seasoning each layer with mesquite seasoning. Place salmon filet on top. Fold over the foil to seal the packet tightly. Bake in preheated oven until vegetables are tender and fish flakes easily with a fork, 20 to 25 minutes. Serve with lemon wedges. Enjoy fresh salmon with tangy fruit salsa, an elegant 600-calorie meal. 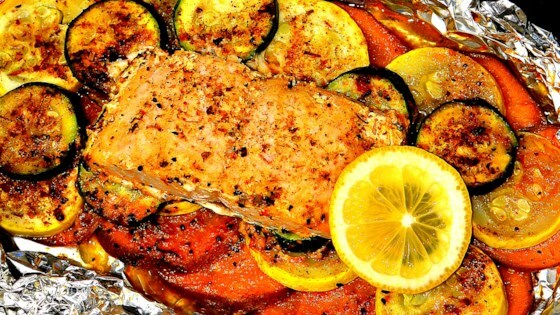 You can also cook the salmon foil pack on an outdoor grill.